“There is no enemy as lethal as the one who comes disguised as a friend” Hassassin Doctrine Hussein Al-Djabel is a veteran Fiday, a professional killer. After twenty years, the scores obtained by Al-Djabel at the Hassassin training centers in the Alamut territories have yet to be beaten. His reputation is legendary and his professionalism irreproachable. The most terrible aspect of his calm personality is the cold disdain he feels for life, both his own and that of others. Al-Djabel is an old-school Fiday, of steel blades and a public and notorious death: “Close, so close that you can tell what your victim has had for breakfast”. He has fallen three times in action, but he is so valuable that the Old Man has always provided him with a new body. As with any other Fiday he does not have a Cube, so, to save his personality, he has to undergo archaic and tedious camera recordings before each mission. As an example of the perfect Fiday, the determination of Al-Djabel is unbreakable. His list of missions is as long as your arm and many of them are studied as examples in the Hassassin academies. 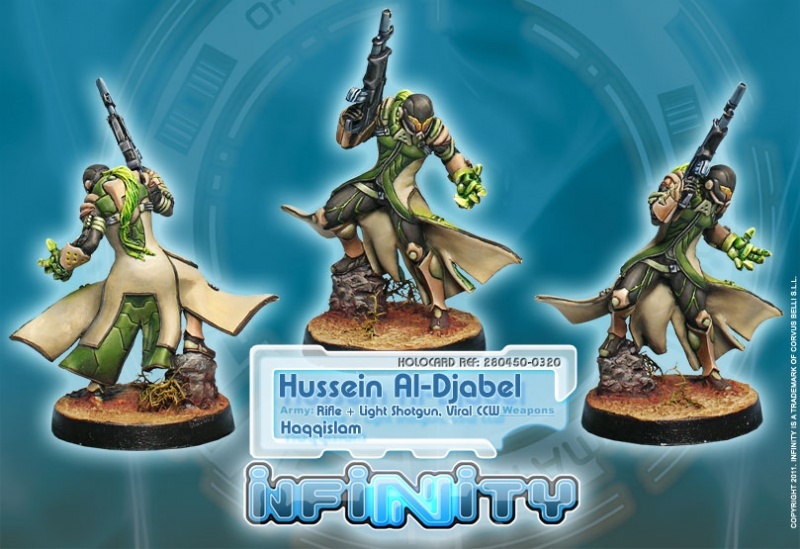 During the NeoColonial Wars, Al-Djabel infiltrated a mother-ship of the Order of Santiago for eight weeks, waiting for the best time to eliminate the Abbot-Commodore Ulloa. He adopted different identities, none of which were discovered, allowing him to get close to his victim without raising suspicion. He executed the Abbot-Commodore in front of all his officers and with a display of sheer skill, he managed to escape alive from the mother-ship. The Order of Santiago has a juicy reward for Al-Djabel’s head and another, even more generous, for his personality record.